This discreet accessory enables AXIS F1025 Sensor Unit to be easily mounted in the ceiling for overviews of a room or entrance. The accessory is designed so that the sensor unit is tilted to follow the surface of the ceiling. AXIS F1025 Sensor Unit has a field of view of 92° horizontally and 45° vertically. 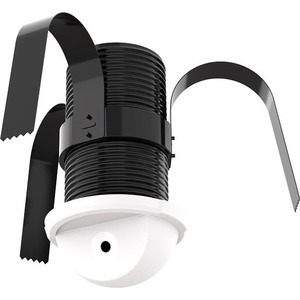 When mounted in a ceiling with a height of 3 meters, the sensor unit will provide a floor-to-ceiling view 3 meters away from the sensor unit. The accessory is repaintable to make it easier for the unit to blend in with the environment. The diameter of the visible part is 54 mm.